My introduction post for EMU’s Debuts was about remembering to have fun. In it, I promised myself that I would try to have fun in the months between signing and publication. Now that my book has finally launched, I feel like I can share something that I didn’t really feel comfortable talking about for the past year and a half. I didn’t really have a lot of fun. Wait! Keep reading. That’s not a complaint! It’s the build up to a revelation. Because a couple of weeks ago, I finally figured out why I hadn’t been having much fun. The epiphany came to me as I wrapped up my first school visit in front of an assembly of 500 K-5 students in an elementary school in Naperville, IL. The answer was so simple that I felt impossibly stupid—and overwhelmingly relieved. I’ve spent my entire adult career working with kids in one capacity or another. I was a classroom teacher for a number of years before moving on to a more administrative role in my school. I left that position to start an enrichment business. The whole reason I began writing was because I love sharing stories with kids. When my book first sold I was thrilled for a number of reasons—not least among them was the fact that I knew that having a book out there would give me the opportunity to engage with kids and story in whole new ways. So when I had to back off on my enrichment work to make time for my writing, I did so confident that it would be an equal trade. But it’s a funny thing. You write a book for children. If you’re lucky (I was very lucky!) you sell that book. But then for the next 18 months the only people reading that book are other adults. It wasn’t until I found myself in front of that group of kids that I realized just how far removed I’d grown from my intended audience. As old habits, old management styles, and (yes) old jokes kicked back in, I began to feel more like myself that I had in months. I was—finally—enjoying being a children’s writer. We call our field Children’s Literature, and I think that name speaks to the dual nature of the genre. At the risk of generalizing, I think that those of us who write for children like to have a foot in two worlds—the story world of children and the literary world of adults. The period of pre-publication forces us to place more weight on the foot that rests in the world of adults—of editors and revisions and reviewers. I wasn’t prepared for that. It unbalanced me. I share this post in case anyone else finds herself or himself experiencing a similar loss of balance. The good news? Once the book is published, things change. The weight shifts. A friend recently told me that the night after my first school visit I sounded more like myself than I had in months. She was right. For the first time since getting the news that my book sold, I’m excited—really excited—about being an author. So go ahead! Ask me if we’re having fun yet! I’m finally able to give the answer I’ve been wanting to give all along. 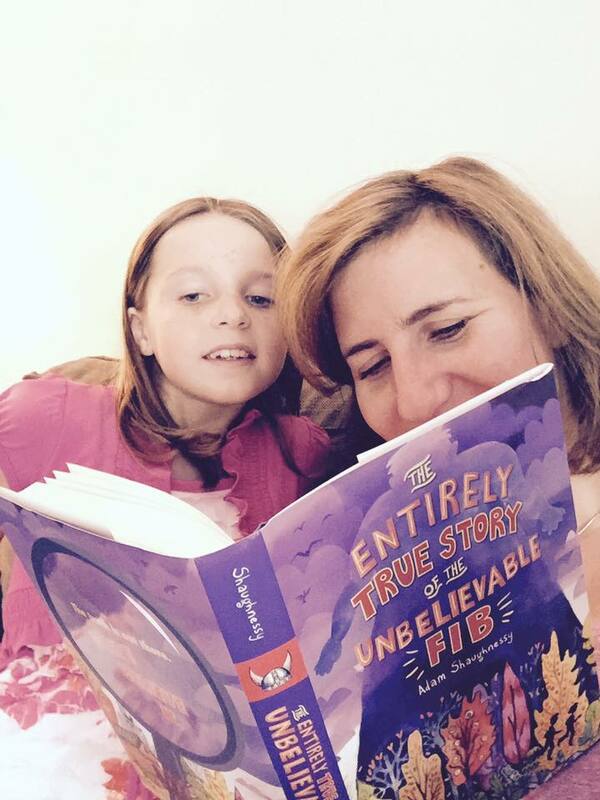 A college friend sent this photo of reading FIB with her daughter—one of the first times I saw a kid with my published book! Oh my gosh, Adam. Yes. Simply yes. I am sitting in my kitchen reading your post and feeling this wave of YES roll over me. Thank you for this. I hear you, Adam! I will add that I prefer interacting with kids through individual classroom visits to assemblies – especially for the early elementary grades, where children REALLY want to talk with the author and rarely get the chance. I’m with you 100% Carol! I love classroom visits, too! Much different dynamic and better chance to interact. Adam, I’m so glad you’re having fun now. So glad you’re back with the kids. So true! Kids are our focus audience, but we do spend a lot of time concentrating on what adults will say about what we write. As a teacher who left the classroom to write full time, I really look forward to school visits, and connecting with kids from a new angle. Thanks for sharing! Always nice to meet another teacher, Carrie. Thanks! This is so true. Thanks, Adam, for your wisdom and honesty! I hear you too, Adam! Thanks for confessing what many of us have been feeling. It’s the kids who matter, and it’s easy to lose sight of that! Yes, this. Thanks for articulating it so well, Adam! Thanks, Laurie—it’s been great seeing that other people felt the same way! That absolutely adds to my fun, Teresa! I hope you both enjoy it!!! This totally resonates with me, Adam. I am having SO much fun now that I’m interacting with kids who are reading my book. A piece I hadn’t realized was missing until I found it. Great post! And Book Scavenger is such a natural for interactions, Jennifer. Glad you’re having fun, too! I’m looking forward to that too, Elly! Can’t wait to read! I did a week of school visits last week. I thought I would like it because I taught school for 26 years and school hallways feel like home. Well I had no idea how much I would like it!!! I loved it!!! I was energized!!! It.was.amazing!! !